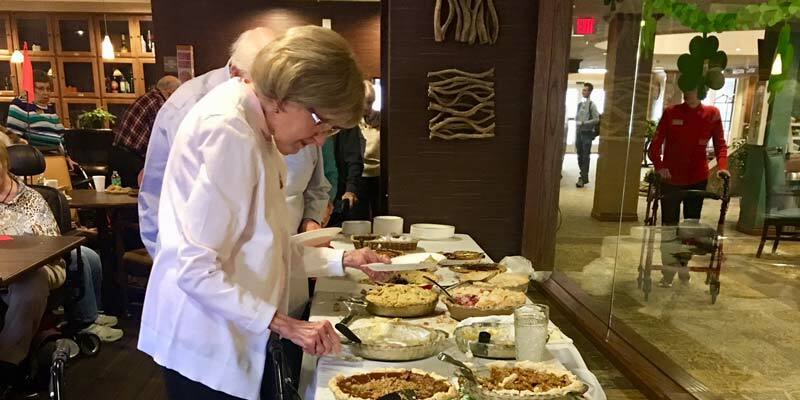 Stone Oak opened in late October 2015 and the following March, some of the residents thought it would be fun to celebrate March 14 as PI Day. So we made a sign-up list and that first year, 11 residents and staff volunteered to make pies. By the next year, it was an official Stone Oak event. What on earth is PI Day? Well, if you were a science or math “nerd," the PI=r2 may still be rumbling about in your brain. PI is the math symbol for 3.14159265… Pronounced pie, we at Stone Oak celebrate by making and eating a lot of pie March 14 (3/14) each year. We look forward to this event every year. Last year we had 36 pies! This year, we “only” had 22 pies to choose from - everything from the always popular apple pie, to the more esoteric persimmon. Chef and his team enjoy it too. They generally get to enjoy preparing a lighter dinner for us, as pie time begins at 2:30 in the afternoon. The line forms in the lounge and stretches to the hallway as we patiently await our turn at the pie buffet. If you’re smart, you come early and "scout out the lay of the land" so that you don't grab a piece of pecan when the raspberry is at the end of the line. Another way to learn what’s available is to check out the array from the dining room as the pies are arranged on a long line of tables against the glass wall in the lounge. PI Day: a welcome and fun event half way through the endless gray month of March in mid-Ohio!